After a breakfast of tomatoes, olives, cucumbers, shepard’s cheese, yogurt and fruit, we motor west to the second largest city in Albania, Durrës, which sits on a lovely bay of the Adriatic Sea. The blue-green seas are calm and beautiful. But we zip past the inviting seas in pursuit of knowledge. Our destination is not the sea and beach but the ruins of the Roman amphitheater. I find consolation that at least the Romans may have been able to stop and smell the sea breezes. 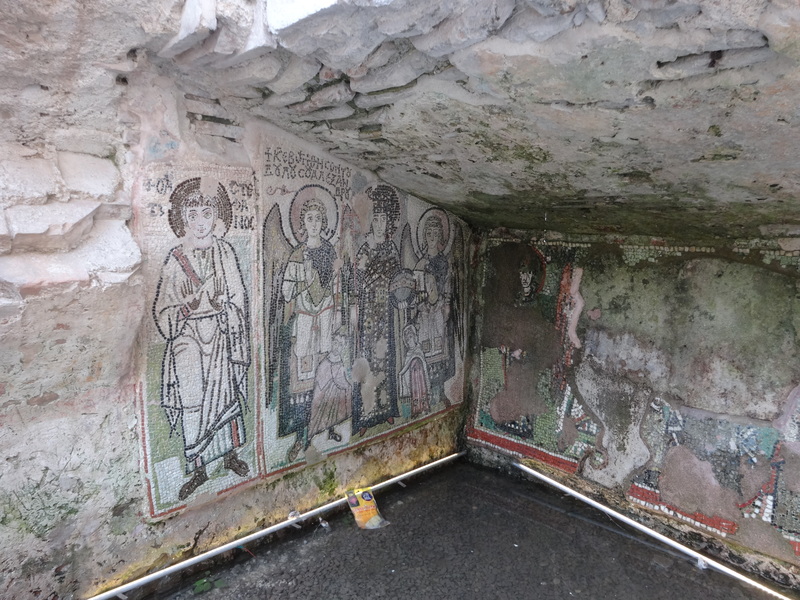 Archeologists are discovering that the entire city of Durrës is an underground museum. Many ruins and artifacts have been discovered in the last few decades with more unearthed every day. This is a city where one dreads excavating for a new home’s foundations as one never knows what will come up in a shovel of dirt. The Romans, possibly Hadrian, built an Amphitheater here sometime in the 2nd century AD, Balkans’ second largest. Views of the sea would have been magnificent. The amphitheater is pretty much in ruins with little surviving but the shape and tunnel entrances. The seating and steps are rubble but the large chariot entrance remains. Above the amphitheater is an old mosque that was used as a Museum of Atheism, created by the communist in their efforts to discredit religion. It is not the only such museum that the communists created, but it is a reflection of communism’s failure to do so. From the amphitheater, we bus a short distance to the Archeological Museum. It is relatively new and its priceless artifacts are well protected from the elements. That’s a good thing because on artful display are artifacts found at the amphitheater and from sites around Durrës. We are guided by a knowledgable curator who takes us chronologically from the earliest times of the Illyrians and Romans. Most of these artifacts were found beneath the streets of the surrounding cities. They are in amazing condition. The most ancient artifacts date from the Bronze Age, as early as 7th century BC. 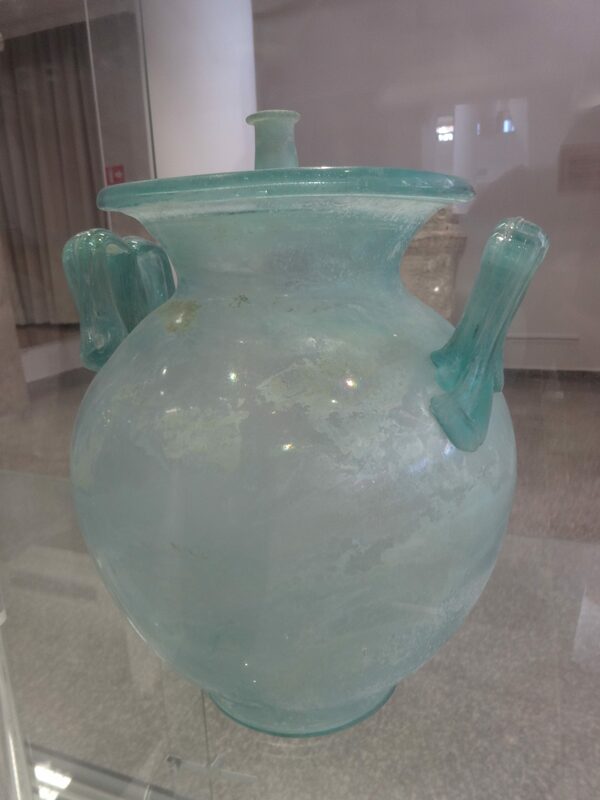 The aquamarine glass pieces of the 2nd century AD, including a large vase found in one piece, are exquisite. Much of the statuary and pottery are unique to the area. There is finely crafted gold jewelry, sarcophagi, and carved Roman statues. It is a fine museum and well-presented. More items are being found weekly around Durrës. I feel we get the “Bums rush” out of Durrës as we speed off for lunch. But there is even better ahead though it is hard to think that way with the beautiful sea and warm breezes of Durrës. From the seaside we drive to the ancient city of Berat, which lies on the eastern bank of the Osum River. 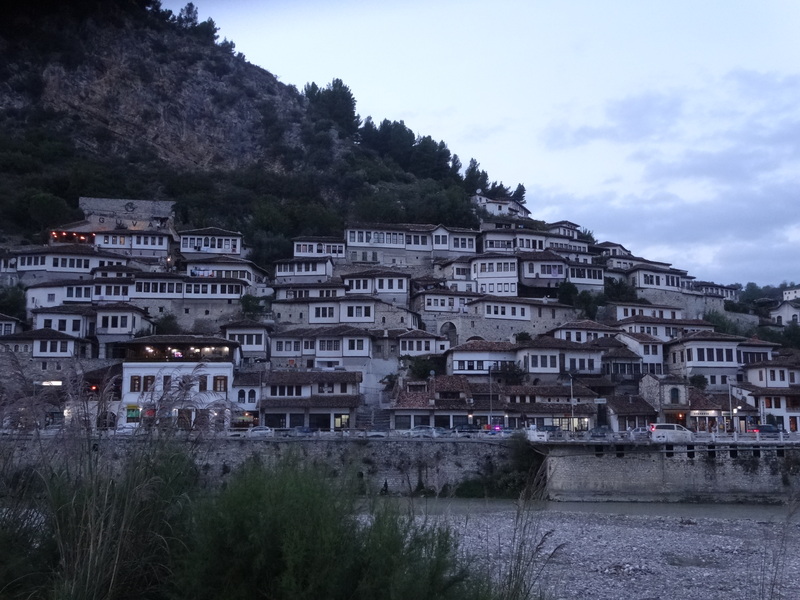 Berat has a wealth of beautiful architecture and is known to Albanians as “The City of a Thousand Windows” or “The City of Two Thousand Steps.” Even past-dictator Enver Hoxha loved it and declared it a ‘Museum City’ in 1961. For me, Berat is love at first sight. 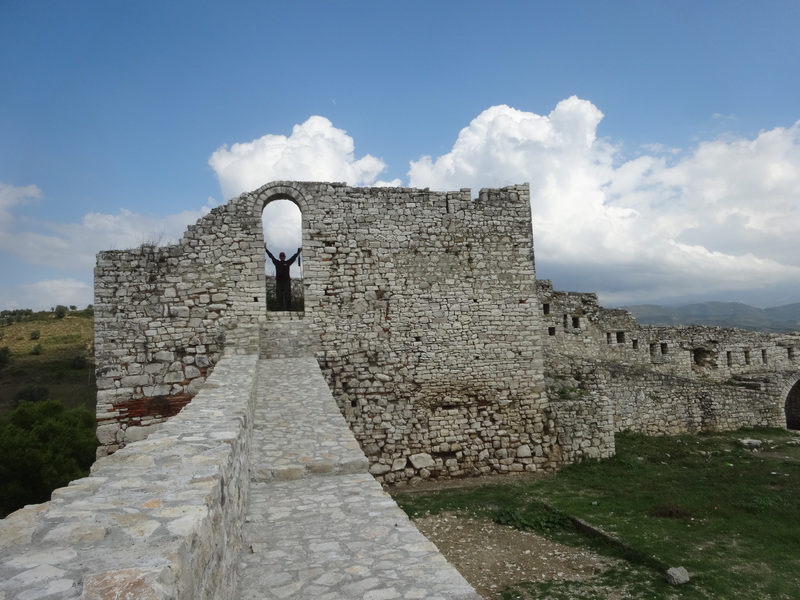 Berat, on the UNESCO World Heritage List, is an city towered over by the historic Berat Castle. Our vans struggle but achieve the climb to the top on roads better cobbled for foot or donkey. 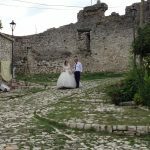 Once atop the fortress walls and within the city, I could loose myself for hours just walking around enjoying the peace and spectacular views of Berat below. Berat Castle with its small community of residents living along its narrow cobbled streets is simply fantastic. I walk a section of its walls and along quiet streets, much like the early Romans must have done. The fortress dates from the 13th century and contains small Byzantine churches and Ottoman mosques. Built on a rocky hill 702 ft above the left bank of the River Osum, the fortress is accessible only from the south. After being burned down by the Romans in 200 BC, the walls were strengthened in the 5th century under Byzantine Emperor Theodosius II, and were rebuilt during the 6th century under the Emperor Justinian I and again in the 13th century. The north entrance is defended by a fortified courtyard and there are three smaller entrances. As I said, the fortress is formidable. 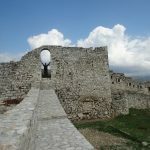 The Second Siege of Berat in 1455, the first real test between the armies of the sultan and the great military leader Skanderbeg, ended up in an Ottoman victory. Skanderbeg besieged the town’s castle for months, causing the demoralized Ottoman officer in charge of the castle to promise his surrender. Skanderbeg errors and relaxed his grip, split his forces, and departed the siege, leaving behind one of his generals, and half of his cavalry on the banks of the Osum River in order to finalize the surrender. The Ottomans saw this moment as an opportunity for attack and sent a large cavalry force to reinforce the garrison. The Ottomans caught the Albanian cavalry by surprise while they were resting on the banks of the Osum, and almost all the 5,000 Albanian cavalry laying siege to Berat were killed. Along the charming streets is the Onufri Museum which displays several 16th century murals and icons by Onufri, Albania’s most famous Medieval painter. Part of the museum is the small Church of the Dormition of Saint Mary built in 1797 over the foundations of an earlier 10th century church. The beautifully carved and gold painted 16th century iconostasis is priceless and in good condition. I also was allowed to walk behind the iconostasis, something generally not allowed. It wasn’t that mysterious back there but the icons and painted panels were interesting. 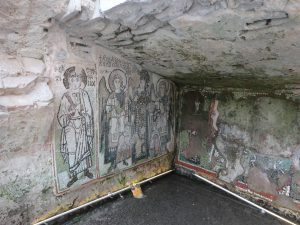 Frescoes, whitewashed during the communist era, are being restored. I did note the early painting of the Byzantine Eagles, one for Rome, the other representing Constantinople. 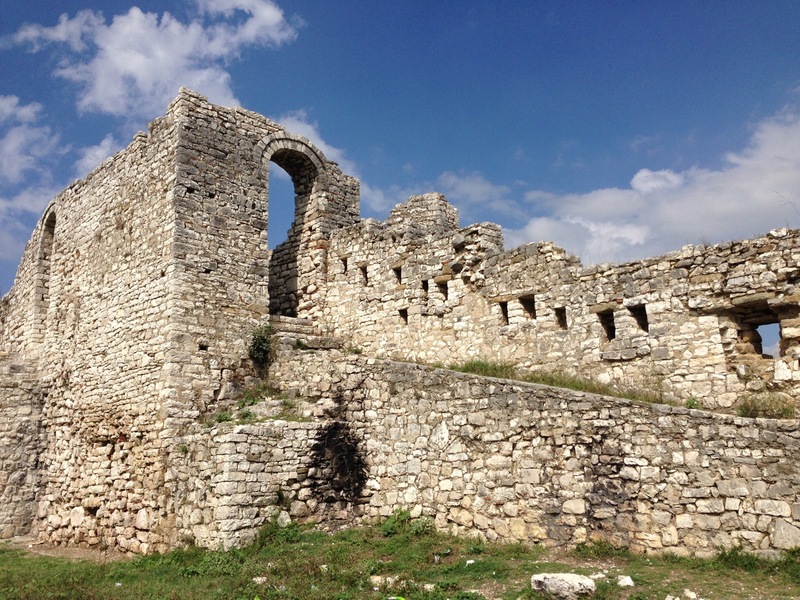 The fortress of Berat, even though considerably damaged, remains a magnificent sight. The surface that it encompasses made it possible to house a considerable portion of the cities inhabitants. The buildings inside the fortress were built during the 13th century and because of their characteristic architecture are preserved as cultural monuments. The population of the fortress was Christian, and it had about 20 churches (most built during the 13th century) and only one mosque built under the Ottoman for the use of the Turkish garrison (of which there survives only a few ruins and the base of the minaret). Remains of the White Mosque and of the Red Mosque’s mineret, built can be seen. But it is most enjoyable to walk around the fortress and climb the walls for fabulous views of the Osum and Berat, “the white city.” And there are many ladies who line the walls outside their homes with samples of their knitting abilities, from clothes to linens of all kinds. There are also places to eat or have a coffee as well as several mosques built under the Ottoman era which began in 1417. The fortress is also a favorite spot for the bride and groom to stroll for their upcoming nuptial video, sort of Michael Corleone-Apollonia style. 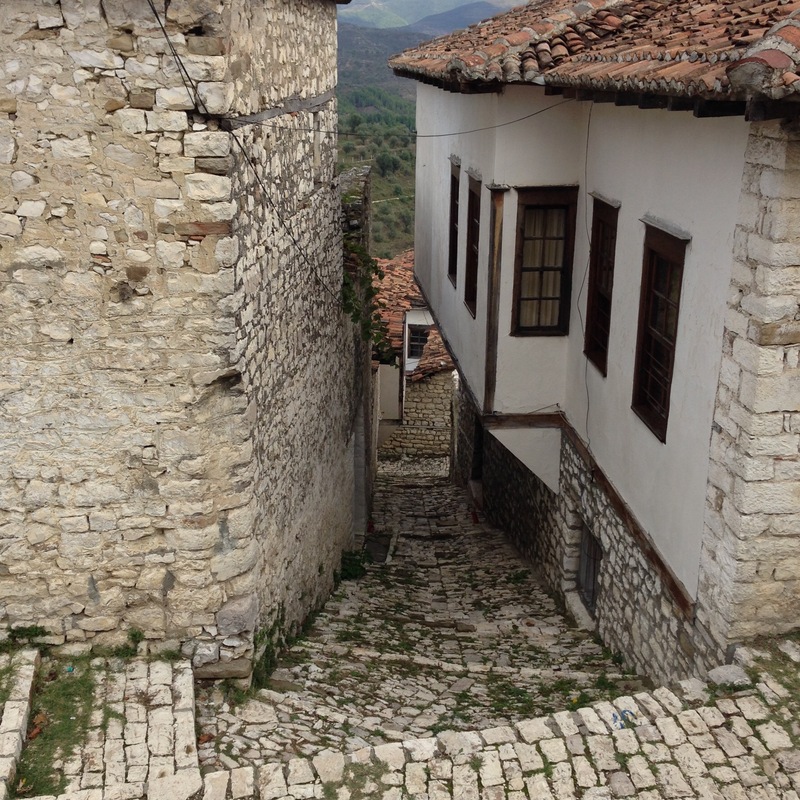 Downhill in the old city is Berat’s Ethnographic Museum. The museum is in an 18th century, traditional two-story home with lobby and porches, a typical rich merchant home. Inside are the usual guest room, kitchen, lady and children rooms, separation of sexes, and selection of period artifacts and crafts. A family of 15-20 lived in the home. 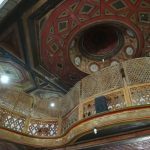 Of particular note are the wood carved ceilings, cabinets, balconies and beams. Example of specific trade crafts were displayed below the living quarters. The King Mosque (Xhamia Mbret) was built in the 15th century. It is in disrepair and struggling to survive. 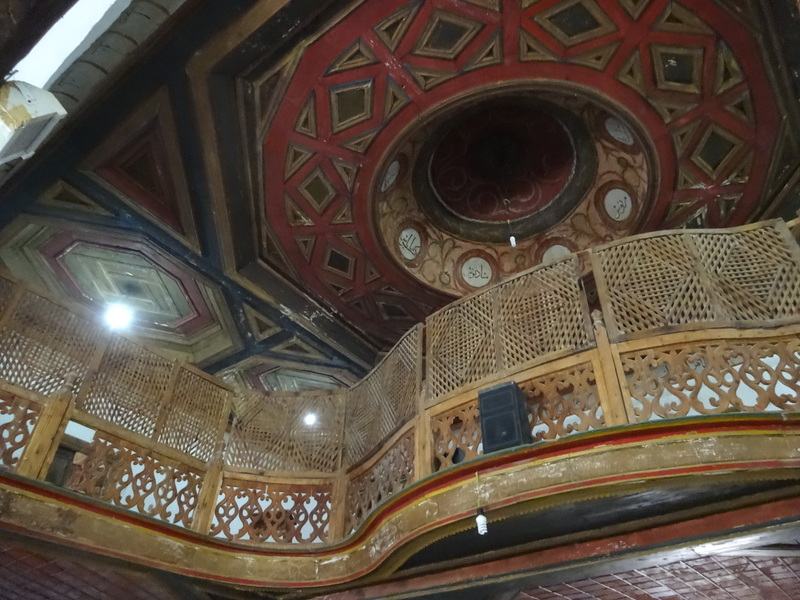 The carved ceilings and interior decorations are very good. I especially liked the women’s balcony tho the stairs to get there must be a struggle for the women. Always we are made welcome to their house of prayer and photos allowed. Just behind the mosque is the Halveti Teqe, The teqe was built in 1782 from Ahmet Kurt Pasha and related to a Sufi sect. The promenade along the Osum River affords a charming vista of Berat. Fishermen line the river bank fishing for their local fish, eager to share their fishing acumen and describe their catch as “small but tasty.” The 16th century bridge across the river leads to our restaurant and a fine dinner overlooking “the white city.” With traditional houses marching up the hillside, Berat is a lovely city and worth a longer stay. As clouds build over the mountains and lightening once again lights the sky, I see the shadows of the city and the castle. 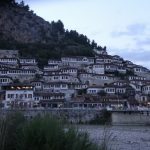 No wonder Berat is such a beloved city.